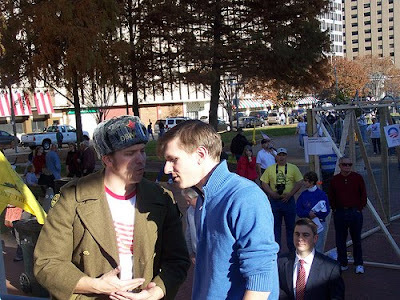 John Burns of American Majority and the St. Louis tea party was implicated in a story about disgraced conservative hitman James O'Keefe's ploy to "embarrass a CNN correspondent by recording a meeting on hidden cameras aboard a floating palace of pleasure' and making sexually suggestive comments, e-mails and a planning document show," according to CNN. Burns is best known in St. Louis for leading the tea party's failed efforts to block funding for public transportation, for ridiculously accusing Washington University of "fraud" in the aftermath of a hoax conducted by him and O'Keefe, and, worst of all, for writing "free abortions" on the back of a sign in an attempt to sabotage pro-gay marriage rally. Instead, I've decided to have a little fun. Instead of giving her a serious interview, I'm going to punk CNN. Abbie has been trying to seduce me to use me, in order to spin a lie about me. So, I'm going to seduce her, on camera, to use her for a video. This bubble-headed-bleach-blonde who comes on at five will get a taste of her own medicine, she'll get seduced on camera and you'll get to see the awkwardness and the aftermath. CNN was forwarded an e-mail, sent from O'Keefe's e-mail address, to the executive director of Project Veritas, Izzy Santa; and two conservative activists, Ben Wetmore of New Orleans and Jonathon Burns of St. Louis, Missouri, dated after the call with Boudreau. Burns would not respond to CNN. Hopefully, some local reporters can get to the bottom of this. Not only is John Burns, an active member of the STL Tea Party, apparently a regular accomplice in planning O'Keefe's schemes, but the leaders of the Tea Party also know O'Keefe, support O'Keefe, and have defended his tactics again and again. I can sum this up in three words: I'm creeped out.